What could have caused Trump to side with Putin against his own Intel director? 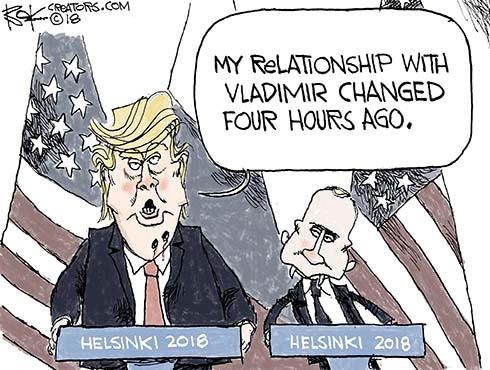 President Trump claimed the U.S./Russian relationship changed for the better during a two hour closed door meeting without notes. And he denied Russia meddled in the 2016 election. That set off a national freak out making “Our Democracy” look unhinged. Former CIA Director Brennan called Trump treasonous. George Will called him an “embarrassing wreck of a man.” Calmer voices said his remarks were worse than Kristallnacht and Pearl Harbor. “Journalists” need to learn the difference between ‘hacking’ and ‘meddling!’ The DNC knew early in 2016 that it had been hacked by the Russians; it didn’t take a year and a half $19,000,000 and Mueller’s investigation to ascertain that. Furthermore all the hacking in NO WAY affected the outcome of the election. It’s obvious to ‘deplorables’ that the Dems goal in this fiasco is to get the dumbed down American public to believe it did and Trump didn’t actually win. Nice try, but no cigar!